It is with great honor and respect to announce that I will be running the 2019 Boston Marathon for the CU Kids at Heart Team, raising money for Boston Children’s Hospital. The 2018 Boston Marathon was supposed to be my last marathon for the foreseeable future. When I was asked to run again, the hesitation was not for the fear of running, but for the fear of not being able to achieve last years fundraising level. That hesitation lasted a split second, realizing that raising any amount of money is better than raising no amount at all. So here we go again! Let’s talk about my son, and my patient partner, Jackson. He, along with all of the other children battling illnesses and diseases, is the reason why I am so passionate about raising money for research efforts for Boston Children’s Hospital. As many of you already know, my son Jackson is both a stroke and Moyamoya disease survivor. On March 17, 2013, Jackson (17 months old) suffered a massive, ischemic stroke to the right side of his brain leaving him left sided weakened. Doctors worked night and day to try and determine the root cause of his stroke. Jackson lived at Boston Children’s Hospital (BCH) and Spaulding Rehabilitation Center for 48 days where he underwent rigorous PT, OT and speech therapy. The care and services he received at BCH saved his life. Three months after his stroke, Jackson was diagnosed with a rare, progressive brain disease called Moyamoya. This disease affects 1 in 120,000 people. In order to survive, Jackson un- derwent his first bilateral brain surgery, on September 11, 2013 at BCH, to restore blood flow to the brain. On September 8, 2015, Jackson underwent his second brain surgery to restore blood flow to the section of the brain where the disease had spread. We feel so fortunate to live so close to BCH where Dr. Smith practices. Dr. Smith can be credited with perfecting the procedure, Pial Synangiosis, that ultimately saves children with Moyamoya disease. Not only does Dr. Smith save the lives of children with Moyamoya, he also devotes countless hours of time to his research efforts for Momaymoya diseases and other neurological illnesses. Dr. Smith’s passion and commitment to Moyamoya research is truly awe-inspiring. I am honored to run the 2019 Boston Marathon with the CU Kids at Heart Team. This will be my third time running with the CU Kids at Heart Team, but my family has been a part of the team for six years. Established in 1996, by Jane Melchionda, the CU Kids at Heart Team is dedicated to helping children, receiving care at BCH, lead healthy and happy lives. For the past several years, the CU Kids at Heart Team has worked closely with the scientists and doctors at BCH to fund special research activities aimed at the prevention, treatment, and/or cure of pediatric neurological diseases, including Sturge-Weber Syndrome, Moyamoya disease, Cerebral Palsy, pediatric brain cancer and epilepsy research. Each runner is paired with a patient partner child who is receiving care at BCH. Many of the patient partners have extraordinary medical challenges, but also possess great spirit, strength, courage and determination. 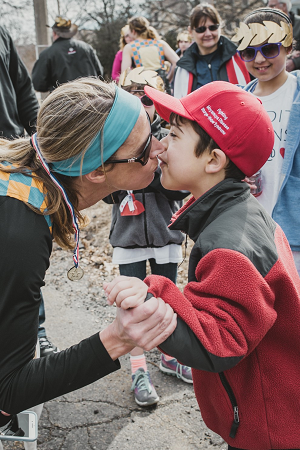 These incredible children, who overcome their own challenges every day, inspire the runners to achieve personal goals that they never thought possible. I am proud to say my patient partner is my son, Jackson. I am amazed at all he has accomplished over the past 5 years since his initial stroke. He inspires me each day and helps me strive to be a better person. Last year, CU Kids at Heart donated $140,000 to Dr. Smith for Moyamoya research. This year, the funds that I raise will be put towards another $100,00+ donation that the team is planning to make for Moyamoya research. This will make over $700,000 that has been donated for Dr. Smith’s research efforts, in six years time! That is an amazing amount of money, and I cannot thank the CU Kids at Heart Team for being as passionate about Moyamoya research as I am.